Nasoya plant protein allows you to make better breakfast choices this spring and include fresh veggies of the season. Heat oil in a large nonstick pan over medium-high heat; Once the oil is hot, add the garlic and onion and saute for about 5 minutes. Add the tofu to the pan and crumble it into small pieces using a spatula. 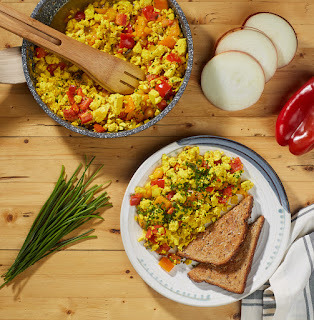 Sprinkle salt and turmeric evenly over the scramble. Turmeric not only adds to the flavor but will also make the tofu look like eggs!